Just before I set off to Thailand for an examining tour in January I received through the post an unsolicited CD. I took it with me fully intending to listen to it but, as things built up, so it never got played and with pressure to review so many other discs, this one rather got overlooked. My relegating the CD was as much due to my expectation that he was just another early 20th century German composer who would, in all probability, inhabit a world of ideas more academic than emotionally communicative and, at best, likely to be unmemorable. I finally sat down to listen to it this week and am now struck with horror at my ignorance and foolish preconceptions, for the disc is of quite remarkable music. Volkmar Andreae (1879-1962) was a Swiss conductor whose reputation was so good that he was invited to replace Mahler as Music Director of the New York Philharmonic. He, however, chose to remain in Switzerland where he was Director of the Zurich Conservatoire and conductor of the Zurich Tonhalle Orchestra, a position he held for 43 years. He was also permanent guest conductor of the Vienna Philharmonic and a noted champion of the works of Bruckner. His entry in Grove tends to downplay his achievements as a composer; "As most of his compositions arose from his conducting associations, male choruses form a large part of his output. During his career he gradually reduced his creative work until he gave up composing altogether. Earlier works are rooted in the Romantic tradition, with Straussian orchestration, while the later music, still tonal, has a refined, transparent sound". I was aware of some of his choral and chamber music from earlier Guild CDs which had come my way, but nothing really prepared me for the incredible richness and scope of his orchestral writing. True, Richard Strauss is very obviously an influence in the Symphony, where the second movement in particular, is a fine example of lavish, opulent orchestration and glorious harmonic riches, and I detect quite a bit of Sibelius in the gloriously exuberant final movement of the Kleine Suite, but with things like the strangely questing Music for Orchestra there is something much more original and distinctive. I am not surprised to learn from Robert Matthew-Walker's very extensive booklet note that this work was much admired by such conductors as Fritz Busch, Felix Weingartner and Herman Abendroth. My puzzle is why it, along with everything else on this disc, has fallen so completely into obscurity. 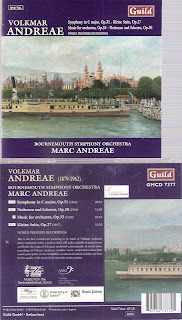 The disc is promised as part of a project to "make available to music lovers worldwide the range of this great musician's achievements" and is actually the first commercial recording of Andreae's orchestral works. Too often on disc in the past great music has been resurrected to great enthusiasm and lavish critical acclaim, which has never translated into concert performances. I am sufficiently convinced by the music on this disc that this is a composer well worth exploring and I will be recommending it to just about anyone who listens to me. It helps, of course, that these are such compelling performances from the Bournemouth Symphony Orchestra. 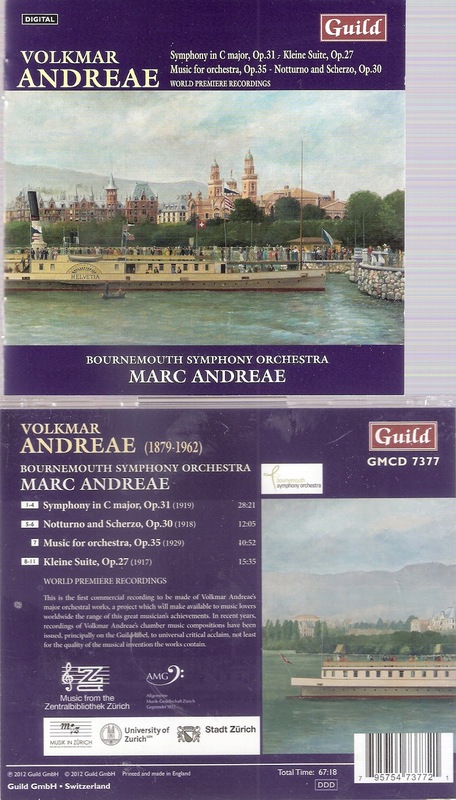 Whether or not the conductor, Marc Andreae, is in any way related to the composer I cannot tell; he was born in 1939 but no biography goes further than to suggest he was born "into a family long prominent on the Swiss music scene". Family connection or not, these are powerfully committed performances which do not so much show a determined advocacy of the composer as an utterly convinced appreciation of the supreme quality of this music. Guild CDs are terribly easy to buy from their website www.guildmusic.com, and I suggest you do just that. Many thanks for publicising the work of Volkmar Andreae. Sadly Guild Music have never sent me any CDs, unsolicited or otherwise. But following your link, I find that they have recently released a CD of Andreae's String Quartet / String Trio and other Chamber Music, and another CD of his Piano Trio. The downloadable excerpts do sound very interesting, and I will order them from Guild as soon as I can penetrate the barrage of error messages in German that I get when trying to navigate their website. Had it not been for your posting, I can safely say that I would not have come across his music through browsing the shelves of HMV, Gramophone or That CD Shop !